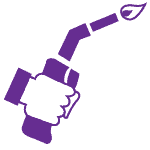 Are you looking to create colossal impact with compact convenience? Do you have trouble finding high-quality lighting with the ease of simple setup? Here at DEKOR® Lighting, we’ve developed a solution to all of those problems and more, with our complete collection of LED Deck Post Lights. Here at DEKOR® Lighting, we consider innovation, customization, and timeless style to be pillars of each new product design. 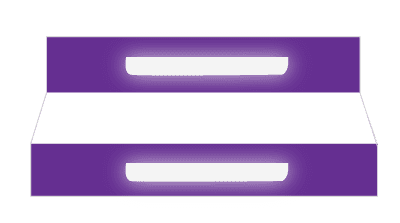 To expand your lighting possibilities, present a new lighting silhouette, and allow for creative application, our product development team went to work creating a new LED post light design that sought to encapsulate all that and more. From countless designs, rewrites, and product tests, the Post Medallion LED Accent Light emerged. This contemporary post light design is unseen in the marketplace, presenting a new and unique approach to accent lighting. 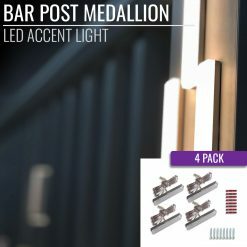 With a slim silhouette available in a classic bar or diamond style, the Post Medallion LED Accent Light enables homeowners to create custom lighting designs and patterns that evoke originality and sophistication. All of our LED deck post lights are made to withstand severe snow, sun, storms, and winds, enduring it all. When we say “Lighting for Life,” we mean it. 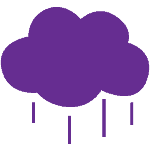 Our powerful EZ transformer is waterproof, freeing you from worry or concern over water damage. And, all of our patented Plug-N-Play™ wiring is sealed, securing your connection no matter what comes your way. With our lasting powder-coated finishings and cast aluminum, your deck post lights will stay polished and smooth through ice, hail, excessive sun, and more. And, if something does chip or fade, your powder coating is protected under warranty for a complete 30 years, and your lighting for 10 years. 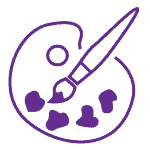 With such an in-depth production process, you’d expect that the installation process is even more strenuous. 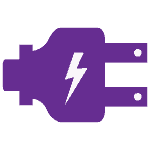 However, we think everyone should be able to experience the magic of DEKOR® Lighting, which is why we developed our patented Plug-N-Play™ technology. 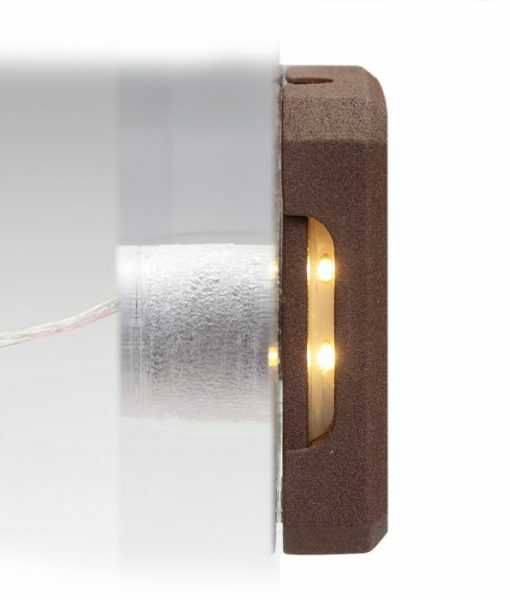 With a simple male and matching female plug, you can connect and activate your lights without cutting, stripping or tracking polarity.And, all of our LED deck post lights are easily mounted onto a deck or fence post with our custom Forstner drill bit. Once you’ve drilled the post sleeve into your post with the Forstner bit, slip the post light skirt onto the component to complete your installation in no time. DEKOR® lighting exclusively uses Cree LEDs in every lighting product, including our LED Post Lamps, delivering radiant shine and saving energy.By conserving your energy usage by 80%, your monthly electric bills are reduced but your brightness isn’t, allowing you to illuminate your home without breaking the bank.And, if you’re looking for an even brighter shine for your deck post lights, you can upgrade to NextGen LEDs, boosting brightness by 300% without boosting electric bills. 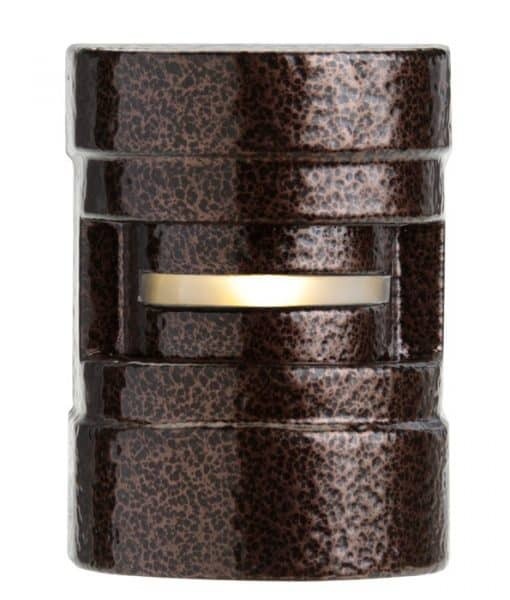 Our newest contemporary addition to the post lights collection leaves the lighting possibilities in your hands. 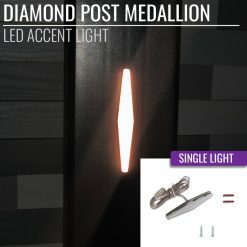 With the Post Medallion LED Accent Light, you can choose from the classic slim bar style for sleek simplicity, or the dimensional diamond style to integrate originality and customization. Both styles of the deck post light are compact and subtle in design, enabling you to add a touch of shine to nearly any outdoor space, from deck posts to stair treads and even baluster rails. Create an original lighting effect on your deck by combining the LED post lights in a variety of arrangements and patterns. 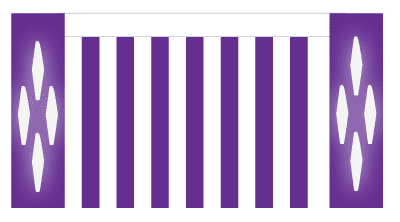 Every home is different, as is every homeowner. With a different color scheme, deck size, and style, your home is a one-of-a-kind creation built on years of dreaming and evolving. At DEKOR® Lighting, we understand this, and we want to better serve your unique style in any way we can. With our newest addition to the deck post lights collection, the Post Medallion LED Accent Light, you can create original lighting arrangements and effects that stay true to your home’s aesthetic. Stack the bar accent lights in a vertical row along the post, create an alternating pattern of diamond style accent lights on your balusters, assemble an original diamond pattern on a post using 4 accent lights of the diamond style, and even diffuse the lighting effect with bar post lights placed horizontally along your stair treads. With DEKOR®’s new LED post light kit, the lighting applications are only limited by your imagination. Love all the products from Dekor, this just added to the obsessive lighting I am doing in my yard, but you can’t find the quality of Dekor Lighting anywhere, I have tried. Mounted them under an eave to illuminate house numbers and backlight a U.S. flag. Worked very well. I am in the process of putting these in a hallway for night lighting. I hooked them to the outside deck caps and used a dusk to dawn photocell. They light up the area inside perfectly. 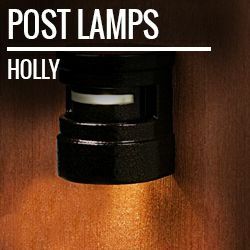 Made from long-lasting cast aluminum, our line of Holly Post Lamps provide dazzling shine and simple setup while staying bright for years to come. Featuring 2 bright Cree LED lamps, this compact, yet robust lighting solution is a simplistic and striking design that can be installed in minutes. These heavy-duty outdoor deck post lights feature 2 bright LED lamps, with 1 single LED Up Light at 0.26 watts and 1 Down Light at 1.2 watts. 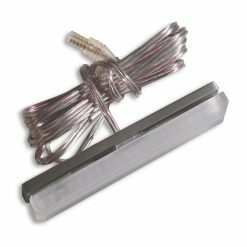 The post light cover slips right over our easy-to-install bracket, providing quality shine without requiring expert knowledge. And best of all, your lights are protected under warranty for 10 years, giving you home-grown handcrafting you can depend on. The Holly LED Post light is the perfect size for any deck or fence post, at only 3 ½″wide, 4″ high, and 2 ½″ deep. With your choice of our 7 popular powder coatings, all backed by a 30 year warranty, you can beautifully light up your home and maintain polish and shine. 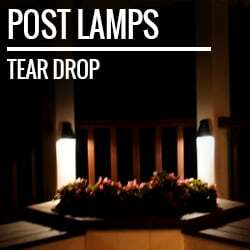 Our Tear Drop Style Post Lamps deliver superior shine while making setup a breeze. Featuring 1 brilliant Cree LED lamp, these long-lasting deck post lights are individually crafted from heavy-duty cast aluminum, accenting your home with a stunning glow for life. 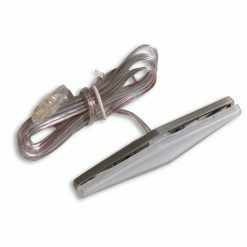 The die-cast aluminum implemented in every LED post light is commonly used in the aerospace industry to endure extreme weather and wind, so you can rest easy knowing your outdoor deck post lights will stand strong through it all. The durable aluminum post light cover easily slips over our lamp bracket, installing in a flash without fuss, stress, or confusion. 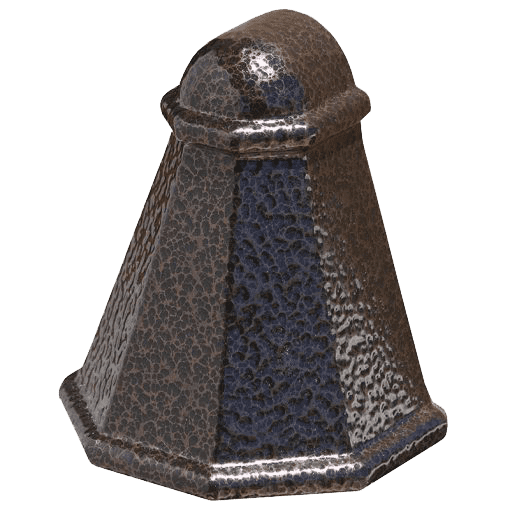 The tear drop style post lamp is a compact 3 ½″ wide, 4″ high and 2 ½″ deep, fitting on any deck or fence post no problem. The small sizing of the lamp counters its big impact, with a radiant glow that will light up any night. 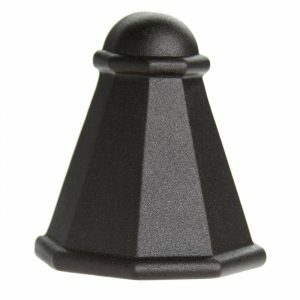 Choose from our collection of 7 powder-coated metal finishes to make each post light your own. 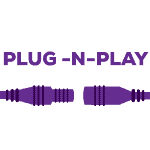 If you have any hesitations or questions regarding the installation process, feel free to call our customer service team to resolve any issues. 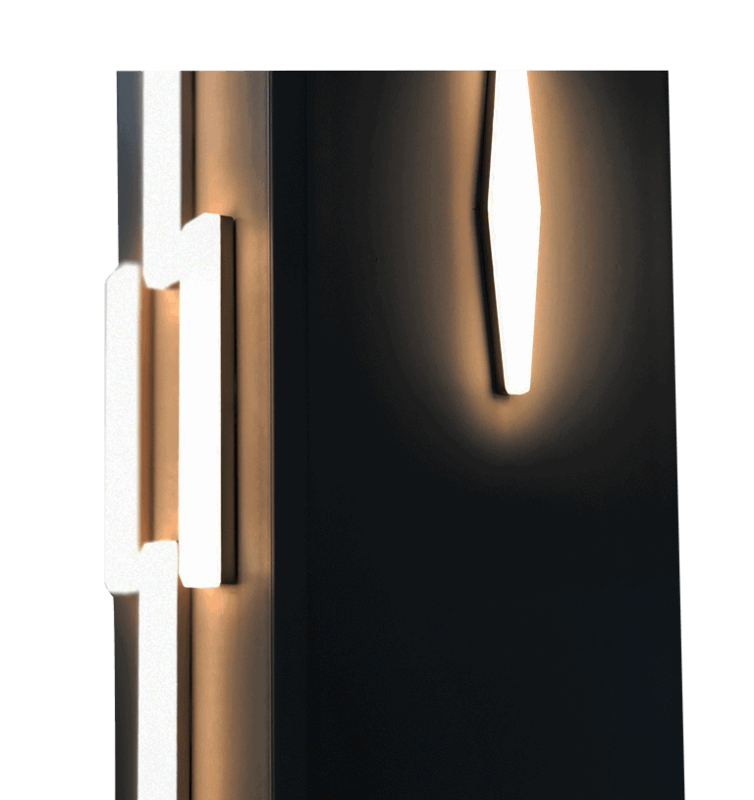 DEKOR®’s one-of-a-kind Elite Bidirectional post light delivers dazzling shine and refined functionality like never before. With two distinct light windows cascading a stunning glow through the cast aluminum, your yard will come to life under the Cree LEDs. 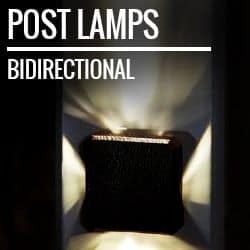 Use the moisture-proof Elite Bidirectional post light on your dock or deck, functioning as both a post lamp and wall lamp. This low profile light creates a dimensional cross pattern of light that can be admired by all. The Elite Bidirectional Post Lamp is a versatile addition, with easy mounting capabilities both horizontally or vertically. 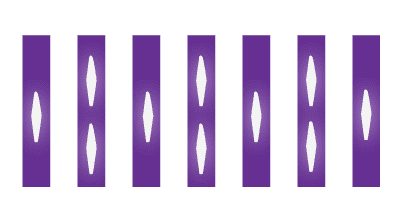 By rotating the mounting position, you transform the lighting effect, with bidirectional light from the top/bottom or left/right. Each Elite Bidirectional LED post light is sold individually, allowing you to find the precise number of lamps needed to complete your deck and elevate your lighting experience. With a complete assortment of 7 natural powder coatings, elegantly accent your home with a variety of metal shades. 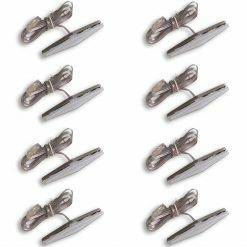 If you want more customization and freedom with your lighting, our Directional Petite Deck Post Lights are made with you in mind. 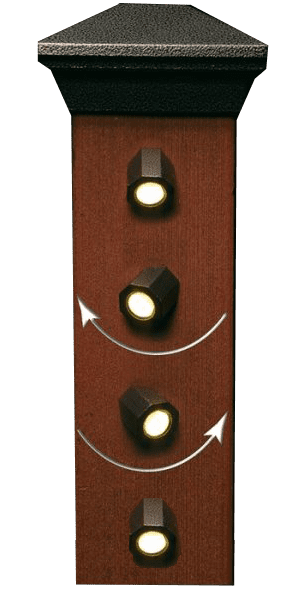 Originally designed to be used on deck posts, our Petite Deck Post Lights have exceeded expectations and possibilities, with the ability to be used as outdoor deck post lights, wall lights, soffit lighting, and more. With a complete 360° rotation and an optimal light angle of 35°, you can select your ideal lighting direction by simply turning the light in the mounting socket. Installation is a breeze as well, with simple step-by-step instructions to guide you along. Simply drill a hole in the location of your choosing with our custom Forstner drill bit to a depth of ½”. 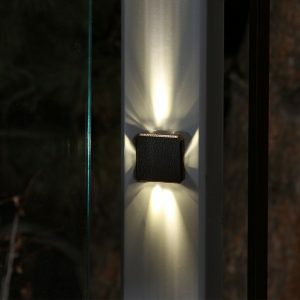 Attach your post lamp bracket, connect your wiring, and slip the post light cover on top to illuminate your home in no time! 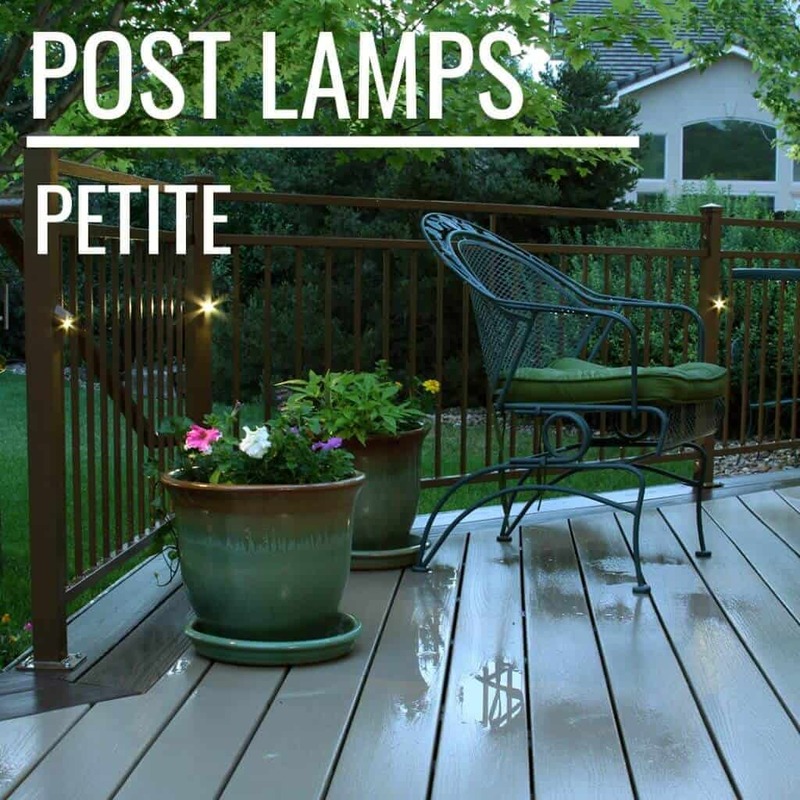 Our DEKOR® customers have innovated the lighting game, finding versatile uses for Petite LED Deck Post Lights. They’ve been used to illuminate a home’s exterior with a simple mounting into soffits, on fireplaces to illuminate the mantle and provide a warm accent to picture frames and other statement pieces. We’ve even discovered users who embedded Directional Petites within their cabinets to provide visibility and clarity, as well as entertainment centers and more. Choose from a variety of 7 metal powder coating colors to customize your lighting and complement your home. 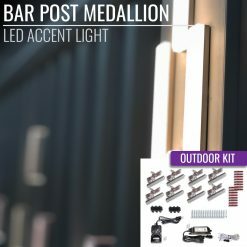 The Outdoor Directional Petite Post Lamp kit comes with 8 compact light units, allowing you to complete your deck and create the ultimate lighting experience. 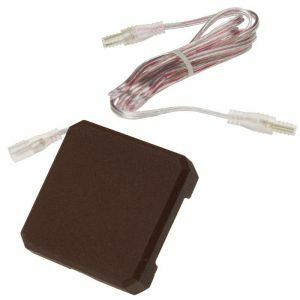 Included in every post light kit is our powerful 36W EZ waterproof transformer, with the ability to activate 30 individual LEDs. 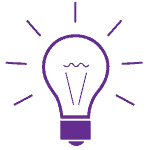 But, if you’re looking for more comprehensive lighting, you can upgrade to a stronger transformer for more post light power. Also included, the EZ PhotoCell dimmer allows you to dim, time, and schedule your lighting to fit your life, as well as activate Dusk-to-Dawn. 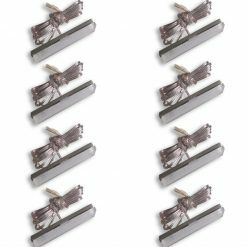 If you want to expand your lighting beyond the 8 included Petite Deck Post Lights, check out our Directional Petite Post Lamp 4 Pack for added dimension and flexibility. 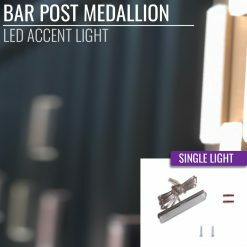 The bar post light style is ideal for uniform patterns that echo minimalism and synchronicity, while the diamond LED post light style is a perfect way to add ornate detail and flair to any deck. To create a dimensional lighting effect, combine multiple LED post lights into alternating arrangements and complex patterns along your deck. 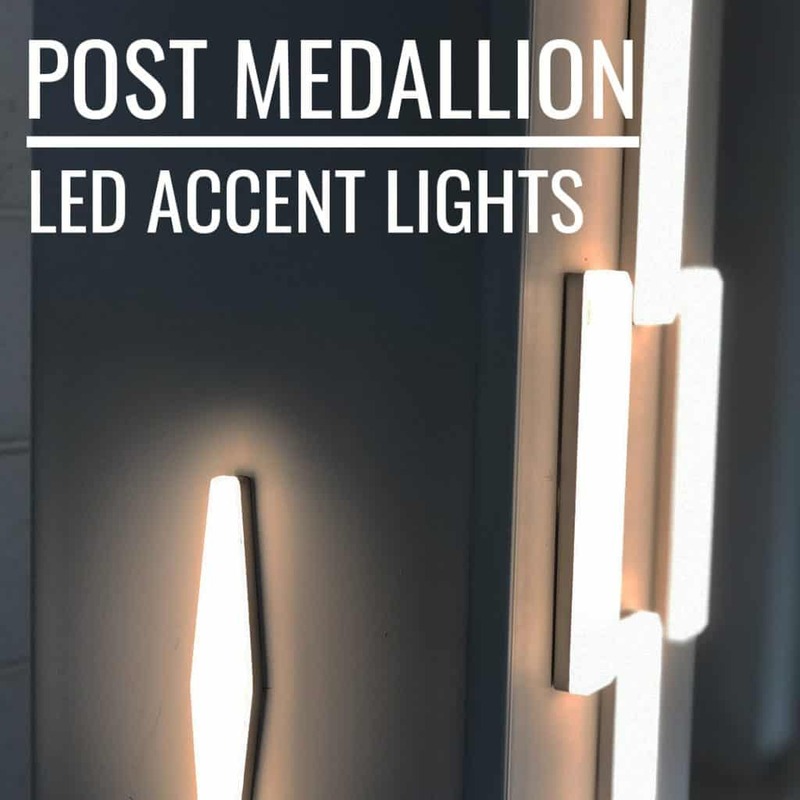 The Post Medallion LED Accent Light allows users to create original lighting patterns and effects with ease. Measuring a meager 4” long by nearly 1/2” wide, the Post Medallion Accent Light is small enough to be installed in nearly any location. With a lightweight design that eases installation without sacrificing quality, the Post Medallion LED Accent Light enables quick setup that stands the test of time. 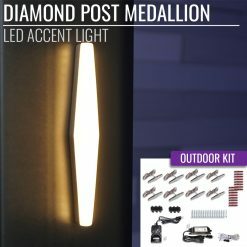 Using robust aluminum, low-profile design, and DIY-friendly Plug-N-Play™ technology, the Post Medallion accent light contains the same dependable DEKOR® engineering you know and trust. To highlight the versatile appeal of your Post Medallion LED accent lights, incorporate these small-scale components onto stair treads, deck posts, and even balusters for a revitalized and polished look. 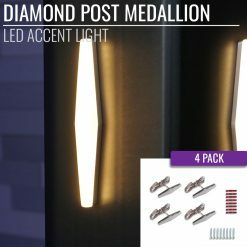 The Post Medallion LED Accent Light is offered in 3 DIY lighting kits that enable any homeowner to upgrade their home with ease. 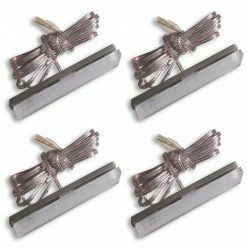 The Post Medallion 4 pack includes 4 LED post lights of your chosen style, bar or diamond, along with 8 - 32 pressure-sensitive adhesive strips that secure your lights with ease (2 per diamond or 4 per bar). 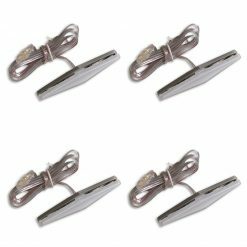 The 4 pack also includes 8 mounting plate screws if you’re looking for added strength when adhering. 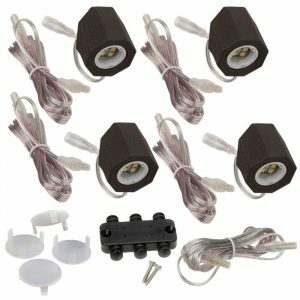 The full outdoor post light kit upgrades your total light count to 8 Accent Lights in either style, with a total 16 - 64 PSA strips to secure your lighting in seconds, as well as 1 20-foot transconnect cable, EZ Max 60-watt transformer, photocell timer, and multi-port splitter. 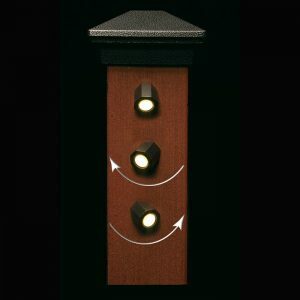 Each style of the post medallion light is also sold individually to allow for precise customization and design. 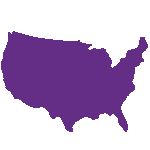 Because we’re based out of the US, we can provide our beloved customers with a no-questions-asked warranty the competitors can’t beat. All DEKOR® LED lighting products are protected from flaws in workmanship and production for a complete 10 years, giving you peace-of-mind and reliability with your deck post lights. And, our powder coating warranty takes it up a notch, with a whopping 30 year warranty that keeps your lighting looking fresh for years to come.